Hartzell Propeller has developed a new 3-blade ASC-II™ composite propeller for Van’s Aircraft RV-10 – it’s available to order directly through Van’s Aircraft. Piqua, Ohio – July 17, 2012. Hartzell Propeller Inc. (AirVenture 2012 booth #1035) has developed a new 3-blade ASC-II™ composite propeller for Van’s Aircraft RV-10. The new prop is four pounds lighter than Hartzell’s previous model due to the certification of a lighter-weight hub. It’s available to order directly through Van’s Aircraft. 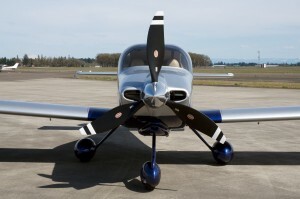 Hartzell will deliver the first of its new props to Van’s Aircraft in August, 2012. Hartzell’s 3-bladed composite propeller noticeably improves the smoothness of flight on the RV-10 when compared to the 2-bladed aluminum propeller. The ASC-II’s proprietary blade design features a carbon fiber monocoque construction with co-molded leading edges of electroformed nickel for erosion resistance. Gus Funnell, Van’s Aircraft, technical support, said, “Hartzell’s 2-bladed blended airfoil prop for the RV-10 is a great performer and their new lightweight 3-blade composite propeller is noticeably smoother without giving up much performance. We’re happy to offer our customers either option directly through our catalog to our customers, worldwide. FAA Type Certification of the propeller also reduces owners’ fly-off requirements so they can get in the air sooner. When mounted to a certified engine, such as the Lycoming IO-540, fly-off requirements are reduced to 25 hours, instead of 40 hours, which is the standard for experimental aircraft like the RV-10. Available for order through Van’s Aircraft, the 2012 catalog list price is $16,070; and it’s offered with a one-year or 1,000-hour Hartzell warranty, as well as a six-year/2,400-hour TBO. The propeller assembly with the new lightweight hub weighs approximately 55 pounds.